With macOS High Sierra, Apple introduced its new file system called APFS (Apple File System) for Mac computers. APFS replaced the Mac OS Extended (HFS+) as the default file system for solid-state drives and other flash storage devices. When macOS High Sierra is installed on an SSD, the drive is automatically converted to the APFS. Reports are coming in that the new macOS Mojave automatically converts not just SSDs but also hard drives to APFS when users upgrade from High Sierra to Mojave. As you know, Windows 10 doesn’t support APFS by default. We need to install third-party file system drivers to open files in APFS drives. The rule doesn’t apply if you have installed Windows 10 in dual boot with macOS on a Mac using Boot Camp as the required file system drivers are automatically installed by Boot Camp. If you need to open an APFS drive, unfortunately, currently there is no free software out there that can help you open APFS drives in Window 10 for free! However, you can use the trial copy of software mentioned below to access APFS drives in Windows 10. 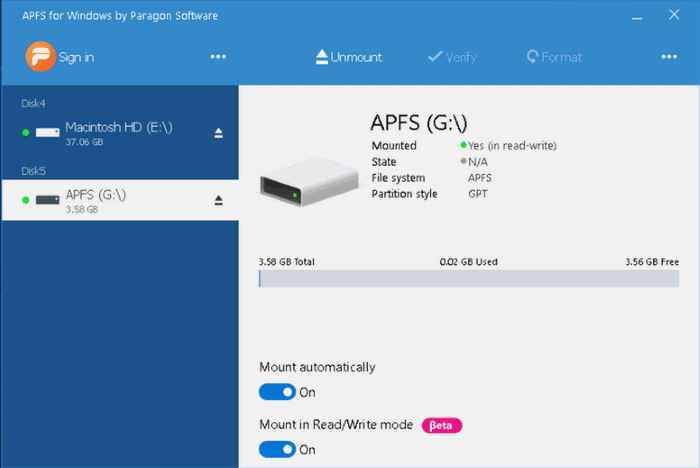 APFS for Windows by Paragon Software is one of the software that you can use to access APFS in Windows 10 and earlier versions. By installing APFS for Windows, you will be able to view, read and write drives formatted with APFS. The APFS for Windows, although is not free, offers 8-day trial. If you often need to access APFS drives in Windows 10, you better buy a copy of this software! MacDrive APFS another software around to help you access APFS formatted drives in Windows 10, Windows 8 and Windows 7. The catch, however, is that it can give you only read access to APFS drives. So, if you need both read and write access, Paragon APFS for Windows is the ideal solution for you. Like Paragon APFS for Windows, MacDrive APFS is also not free. You can download the 5-day full trail copy by visiting the developer’s page. UFS Explorer Standard Access yet another commercial software out there to help you access files located in APFS drives. In addition to Windows 7 and Windows 8, UFS Explorer Standard Access supports Windows 10 as well. I should have clarified that the application installs and sees my APFS portable drive but refuses to mount it, even in Read Only mode. And I should add that their website’s APFS for Windows – Troubleshooting page has several titles of articles but no content. Very disappointed in the software and their customer support. I purchased their HFS+ for Windows and Microsoft NTFS for Mac products and they work fine. I need the APFS for Windows because I know have an APFS formatted disk and would like to be able to work on the files stored there when I’m at work on my Windows box. No luck. Sadly, I’ve been unable to get Paragon’s APFS for Windows to work on two different Windows 10 PCs, and their support has been unresponsive after I sent them the log files they requested several weeks ago. I’d love to be able to say it works but it doesn’t.